As soon as you install Exchange 2010 Server you cannot help but notice the Server Role Selection wizard. This encourages you to plan the function of each Exchange Server from the outset. For small companies, this means deciding how many tasks to combine on one Server. Having a new server is a great excuse for buying new hardware; this is especially true of Exchange 2010 as the production version will only run on 64-bit processors. 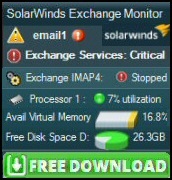 ExchangeServer 2010 concentrates on its core email business. Gone are peripheral such as Conferencing and Instant Messaging of Exchange 2003. However, Exchange Server 2010 will allow you to deliver voicemail to the Outlook inbox. This page represents my site map for Exchange 2010. My mission for this section is to give you advice on how to Configure, Migrate and Troubleshoot Exchange 2010. For example, Exchange 2010 has a new powerful yet simple installation mechanism. Most of the big changes in directory services came between Exchange 5.5 and Exchange 2000. Nevertheless, there are lots, of neat improvements in Exchange 2003 that were missing in Exchange 2000. For example, RPC over HTTP, ExDeploy, ExMerge and Query Based Distribution Groups. Exchange 2010 continues this trend of steady improvements rather than revolutionary new ways of delivering email, for example, CCR (Cluster Continuous Replication) and Unified Messaging. I also find that some of the ‘rough edges’ have been removed. You can see what I mean by navigating smoothly around the new Exchange Management Console, compared with getting lost in the old Exchange System Manager. Is Exchange 2010 Server Really Easier to Manage than Exchange 2003? Can it be true that Exchange Server 2010 is easier than Exchange 2003? Guy says it depends what you mean by easier! Exchange 2010 is more straightforward to get started, but it has more individual components to consider than Exchange 2003. Yes there are new exiting features, but each item needs time to evaluate. It’s true that the wizards are cleverer, and they guide you surely through the necessary configuration, but there are more of them to get to know. Good news, Microsoft has always been good at migrations and transitions, after all it’s in their best interests to make the latest and most expensive systems easily accessible. The secret of a successful transition is to seek guidance from Microsoft’s installation wizards. See more on the transition to Microsoft Exchange Server 2010. When your Exchange 2010 Server needs to receive email from the internet, then you you need to configure MX records (Mail eXchange) in DNS. If you are troubleshooting then remember its your email server that people need to find. Actually, the CAS role for Exchange 2010 server is installed by default. However, it is easy to add CAS as a role if you omit to select this role on the initial installation. Two things you should remember about CAS, this role is needed for each site where you have Exchange 2010 Mailbox servers, and CAS is the gateway for OWA clients. Cluster Continuous Replication gives administrator’s peace of mind that their mailbox servers are protected from a single point of failure. To master this technology, I advise investigating the components, and playing with Cluster Tools such as the Failover Cluster Management tool on Windows Server 2008. Then develop a CCR plan to suit your network, only then are you ready to install the Exchange Server 2010 mailbox servers. Confusion from too many drilldowns before you reach the target. Certain configuration settings are not available in the GUI, thus you need to learn the appropriate PowerShell command. This history of Exchange server is typical of Microsoft, they get there in the end Exchange Server 2010 is an excellent email system. However, early versions were weak, had little security, and only supported about 500 users. Before that there was Microsoft Mail v 3.5.